WoW continues to be mostly fun – the good/great part is grouping with friends and doing some dungeons/instances – the 5 man variety. 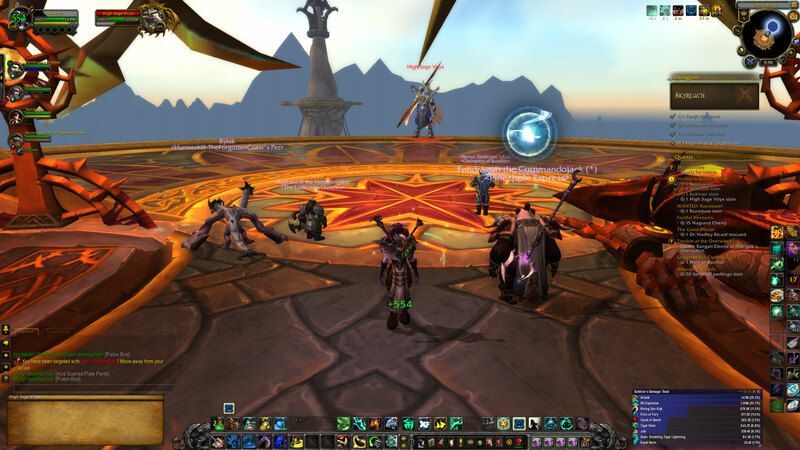 One night 3 of us level 100s were on, a rogue, monk (me), and warrior, so we grouped up and queued for random instances. Since we had a tank, our queues pop really quick (within a minute or two) which is awesome. Later, my rogue friend and I queued and it took about ~30 mins to get in as 2 DPS, which also isn’t too bad really. Still, having a healer or tank to queue with is a major advantage. I know it’s just executing a rotation against AI but I think Blizzard does a good job with the artwork/design and boss fights. They are fun and most bosses have some quirky mechanic you have to deal with. So far the typical “don’t stand in the fire” applies, but there are some other ones that involve hiding being objects, fighting various adds, blocking a light beam while fighting, enraging and stampeding in some random direction, etc. These mechanics add some variety and contribute a bit more complexity than just wailing away at a mob with high health… but overall the feeling of teamwork to defeat the boss is plain fun. Watching the boss wind up their big attack is also entertaining, as long as you also remember to react. The 2nd time we went into Skyreach, our healer was a Mistweaver monk – the first one I’ve seen in Draenor. I’ve had Paladin, Druid, and Priest healers, but no Shaman or Monk until now. Well, still no Shaman because we got a monk. It went well, which is encouraging since that means I can be a decent/ok and hopefully good healer and provide some flexibility when it comes to doing instances. And heck, a lot of the reason my decision to play a monk, paladin, or druid came down to the flexibility of multiple roles – those 3 classes are able to serve all the roles. So perhaps this weekend I’ll look into Mistweaving on Suldrun, and practice in the Proving Grounds instance. Eventually I’ll try healing for a guild group which should be less demanding than an average random group. Earlier while questing on my level 33 druid, a level 42 or maybe 44 warrior attacked me. They used their root/charge skill but I was able to hit escape via Displacer Beast and Prowl (teleport/speed buff plus stealth, for those not familiar with druids in WoW). I found a safe spot and watched while stealthed; after a few minutes the enemy mounted up and rode away. Gankers are bullies that seek easy fights, they are lazy and don’t want a challenge. However, having stealth and situational awareness is not a guarantee. Around 15 mins later the gank occurred, from a stealthed level 100 rogue. I can’t really do much when an attack that I never saw coming kills me in one hit. I can understand wanting some variety away from dungeons and questing, but I personally cannot imagine being so bored that killing other players with zero risk is in any way entertaining. I suppose that’s why I don’t skulk around ganking lowbies because if I’m ever at that point, I’d just log off and do something else. I think I’ll keep track of ganks or good escapes just to highlight what passes as gameplay for some folks. The ganking further cements my opinion that open world PvP – in a themepark as Eri pointed out – is pretty much the worst design in MMOs. To be clear, what I find absolutely awful about open world PvP: ganking. The one-shot-kills are horrifically poor game mechanics. At a lesser level of terrible is all the other stuff: the non-balance between classes, the gear and level differences, etc. I’ve noticed a stratification among my various friends the play, already, mere weeks into the expansion. That stratification is all gear based. I’m not used to playing a game with such obvious gear discrepancies so what probably isn’t a big deal to the long-term players is very noticeable to me. Basically, due to days off and/or other commitments, one group of friends has been able to play more. As it happens, one friend is behind leveling (and gear), I’m in the middle, and two friends are way ahead. One of the ones ahead is a tank, so he’s got an easy time with the instance finder (short queue times), and another was just able to get a lot of hours in so as a result she’s essentially maxed out until raiding starts. On the one hand this is cool, part of the fun is the loot-upgrade design. One the other, we can’t group anymore for instances as there is a low/high limit on gear/level before entering an instance. Oof! It makes sense – somebody overpowered would destroy all the mobs while somebody underpowered would get destroyed (or not effectively heal or tank for the group). But the side effect is that my friends are split and we can’t group for instances/dungeons at the moment. What would be really cool is if everything scaled – mobs and player level/gear – so that a group could enter and tackle the content at the intended level of difficulty. This would mean boosting the gear/level of lower/under leveled players (temporary boost that only exists in the instance) and nerfing the gear/level of higher/over leveled players (again, just while in the instance). LoTRO provides something along those lines for solo players trying to catch up in the storyline – the Heroic Inspiration buff you can get if you enter (some?) storyline groups quests as a soloer. As I recall, the quest giver has two options – regular group option, or solo with buff option. So it isn’t quite what I mean since the buff applies to make a soloer stronger (like a small fellowship I suppose!) rather than even out a group that enters. Anyway, such a system does not exist in WoW and we’ll be separated for a while, especially with holidays and vacations coming up.